I had such a good summer, full of fun, work, good thoughts, serendipity, hopefulness, crafting, walking, just being, worrying much less. We found by mere coincidence a very nice trainer for our anxious dog Souris and he is so much better now. Before the training we couldn’t convince him to walk outside our neighborhood, he had aggressiveness issues and he would have panic attacks for different reasons. This past month and a half he took long walks in different parts of the city, interacted with humans and dogs and he really enjoyed it! His aggressiveness decreased, although he will always be suspicious towards humans. But his life is so much richer now and training him and meeting with other humans and dogs in training became a great hobby for us too. We look forward for every occasion to go walking and training with Souris. These photos were taken in the exact spot from where we rescued him four years ago, a former socialist chemical plant, now a ruin. Our trainer suggested this spot for different agility exercises and we liked the coincidence of going back there almost on his gotcha day. We reorganized one of our rooms that we use as a workshop and I have the pinhole photo to prove it :). It looks messy in the photo, but it is actually quite organized now. We have now a really large table for the computers, sewing machines, etc and large cupboards for our stuff. Also, we have reorganized the book shelves and now we know were to look for specific books (literature, philosophy, art, teaching related books, etc). Together with my friends, we published a text in an art magazine and we prepare now another text and art work for a different art magazine. We have filmed a video in which we used the gardens that people organize around socialist apartment buildings as metaphors for how people negotiate/appropriate/share/fence off/etc. the public sphere. We have finally bought our first DSLR for this project and it is very nice to have a good camera (even if I’ll continue using my film cameras, too). We have rescued 3 little kittens and with the help of the greatest cafe that also fosters cats, they are all in their forever homes now. These two brother and sister went to the same home. I have embroidered, wove and drew just for the pleasure of doing colorful things. (The case in which I keep my pencils, markers and fancy journal is a vintage beaded purse, a thrift store find my friend gave me). I cooked creatively and that always relaxes me. I took care of my health, drank more water and walked a lot. For this fall, I plan to enjoy school and being with the kids, work on some projects, go to the forest to see mushrooms and colorful leaves at least once, read, write in my diary, send out snail mail to my pen pal, add some new pieces to my mineral collection, take many photos, relax and just be. It is a busy summer for me, with very few days without to do lists. I’m not complaining, I do prefer to be busy and accomplish things, but I’m also stressed these days. So, I do weave a lot. I have finished my entire stash of darning yarn from the seventies or eighties that I have unintentionally collected from different sewing baskets and boxes from the flea market. Also I will finish soon the yarn that I have made from colorful tights and this feels very satisfying. I’m just loving it, I wake up in the morning thinking that I cannot wait to find some time to weave a bit more. This is evidently a sign of anxiety for me but on the other hand finding so much pleasure in something so insignificant seems really nice. Just letting my fingers work, my eyes enjoying the colors and my thoughts wandering is the most calming feeling. 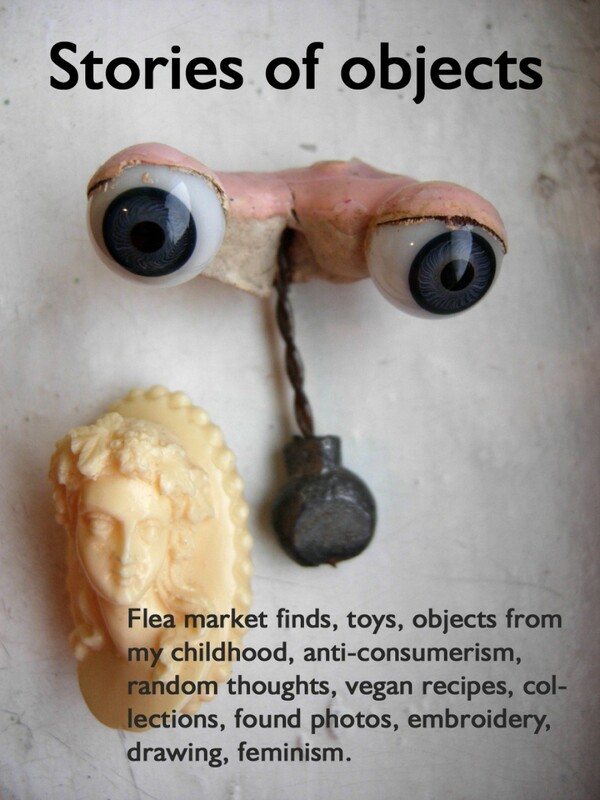 I went to the flea market this Saturday and it was a very good day for finding some of my favorite things. I wanted such a celluloid bangle for a long time now, I kept seeing them online but never at the flea market. This one is a bit too large for me but the other vintage plastic bangle keeps it on my wrist. I really like how the paint faded in soft pinks and greens. This beautiful antique souvenir silver brooch has a damage to the first “e” from Venice, but it was to interesting to leave behind. And I have very nice memories connected to Venice, so it makes sense for me to wear it. The dangling letters are more sparkly in reality than in these photos. This silver wolf pin looks a lot like our dog Souris. This antique brooch is not silver, although it really looks like silver and it is very detailed. I like the snakes and the tiny jade figure (Buddha?). I don’t know if this woven wallet from Peru is vintage or not, but it’s really nice. My favorite find is this big amber ring in an Art deco setting. It has some interesting hallmarks, that I didn’t have the time to research yet. I keep staring at the luminous stone these stressful days. My friend brought back today from a trip to her grandmother’s village this big piece of handwoven hemp fabric. It’s a very thick fabric, used for making flour sacks and such, in the softest, subtlest hues of yellow and pink. Her grandmother wove this a long time ago. Not sure what we will do with it yet, but I like it just like it is for now. There are really busy days for me, full of anxiety, but hopefully I’ll finish soon everything that I have to do and I will regain some time for myself. Meanwhile, I really miss crafting and drawing and reading. These sleeves were made some time ago (the crocheted one is from last year or so and the weaved one is something that I worked on with long breaks in the last months). They are now my external drive and tablet sleeves. My friend machined sewed the spongy fabric inside and the zippers. They look really good and they are practical too. Currently, I plan on finishing a neutral colors weaved case for my friend’s phone. My free time seems so limited lately, although I do actually have time for myself when I manage to be more organised. I do these woven pouches in times when I feel too tired to do something else. They are really relaxing to make. The smaller pouch is made from darning yarn and it is now my temporary wallet till I find one I like with more pockets (I lost my wallet with my ID, etc., it was really stressful but I replaced my documents quicker than I expected.) The larger pouch is made from colorful stockings that my friends and I didn’t use anymore. We didn’t trow them away after they had holes in them in order to transform them in weaving yarn. I like the neon colors of some of them. I currently work on another pouch using the rest of the vintage darning yarn I have collected.